iTools Details Interface is similar to iTunes first interface. But little bit informative and advanced that iTunes. This screen shows your iPhone's Type, Serial number, Jailbrokes status, Region, Warranty details, Activated status, Memory details and Battery life details. It also provide you a button to switch on WiFi. Applications screen gives you all facilities to Install, Uninstall and browse Phone memory's Application area via iTools. Update tab of the top of iTools windows shows notifications which require updates. Another tab to upload / download documents assigned to specific an app. Ex. Media players, document readers, Etc. Media section shows all media files on your iPhone under categories of Ringtones, Video, Podcasts, iTunes U, TV shows, Music and Voice memos. You can Add media files to your iPhone or download them to Mac. Also gives you facilities to Delete, Play and Set as Ringtone. Playlist manager is also included in this section. Photos and iBooks areas allows you to access Picture files and iBook files on Apple device and manage them. This is a great facility. You can view iPhones contact book, Call records and Messages from iTools. 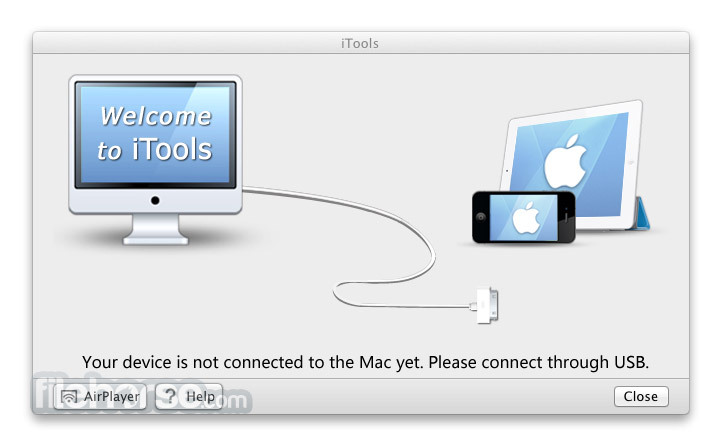 Also send Text messages from Mac via iTools for Mac. Manage contacts and many more. Allows you to browse into File system of iPhone or iPad via iTools. Note: Requires 64-bit processor. Limited functionality.